I had a difficult time photographing today's bridges across the Stanislaus River in Ripon. I drove up and down both sides of State Route 99 but I couldn't find any river access. I ended up walking on a long path that included a pedestrian bridge over the river, but the bridge was covered in mesh that prevented an unobstructed view of the bridges. Finally, I climbed over the fencing at the bridge abutment and hiked over fallen trees and swampy ground to the river. Unfortunately, the sun was low in the horizon and shined directly into my lens. Moreover the bridges were so crowded together, that it was hard to tell them apart. 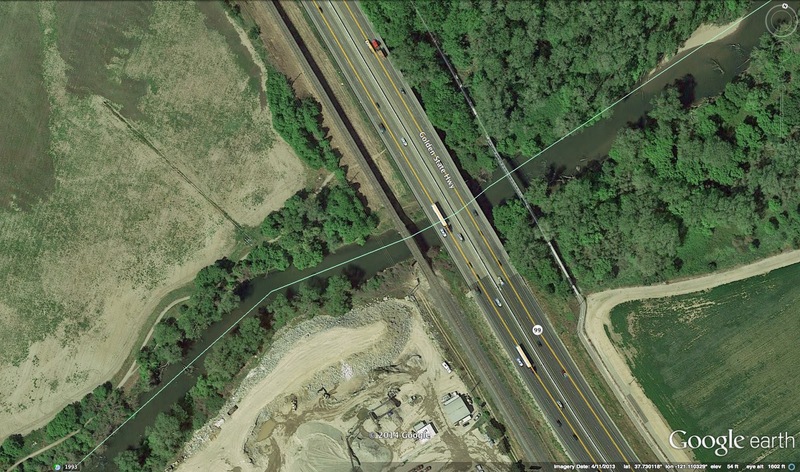 There are four bridges that cross the Stanislaus River in Ripon. The pedestrian bridge on the east side is a three span steel truss. The approach spans are Pratt trusses with the diagonal members sloping towards the middle of the bridge. The main span is a long Parker truss, which is a Pratt truss with rounded top chord. There is no information about when this bridge was built but there is a US Corps of Engineers sign on the path suggesting it may have been built recently. West of the pedestrian bridge are the two State Route 99 Bridges (29 0013L/R). The southbound structure includes a two span closed spandrel arch that was designed by John B. Leonard and built in 1904. The bridge was rehabilitated in 1967 but the two arches remain. The northbound bridge was also an arch that was built in 1948 (probably when the highway was widened) but those arches were replaced with steel girders in 1970. We can see the steel deck girder spans that carry the Burlington Northern and Santa Fe Railroad below the soffits of the highway bridges. However, like these other bridges, this is a replacement for a much older bridge that was photographed and documented by the Historic American Engineering Record for the U.S. Library of Congress. 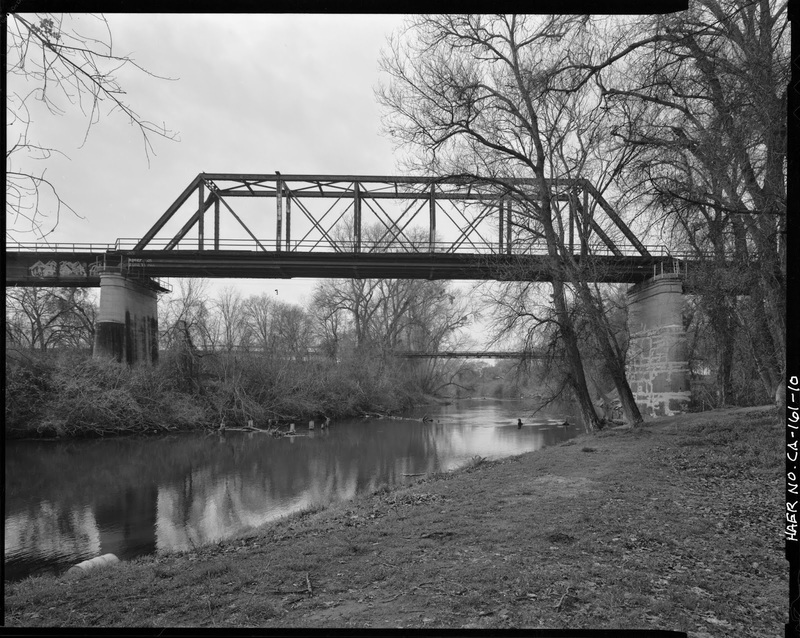 The previous bridge was a Pratt truss that was fabricated by the American Bridge Company in 1905. The current bridge was built in 1995 (although the girders look far older and may have been sitting in a yard. Perhaps the piers are from the older bridge? San Joaquin County, California Bridges: Stanislaus River Bridges by Mark Yashinsky is licensed under a Creative Commons Attribution-NonCommercial-NoDerivatives 4.0 International License.